You know when you’re sitting at home on the couch and a craving just comes over you for cake? Like a good piece of layer cake stacked tall with frosting and sprinkles and everything? This happens to me all the time, and since I don’t have an army to feed, I really just need one piece. The solution to this issue is simply to make one piece instead of an entire cake! Instead of baking a full recipe for cake that would fill three 9″ round pans, this recipe only calls for enough batter for one. Once the cake comes out of the oven, it is fully frosted, then cut and stacked. 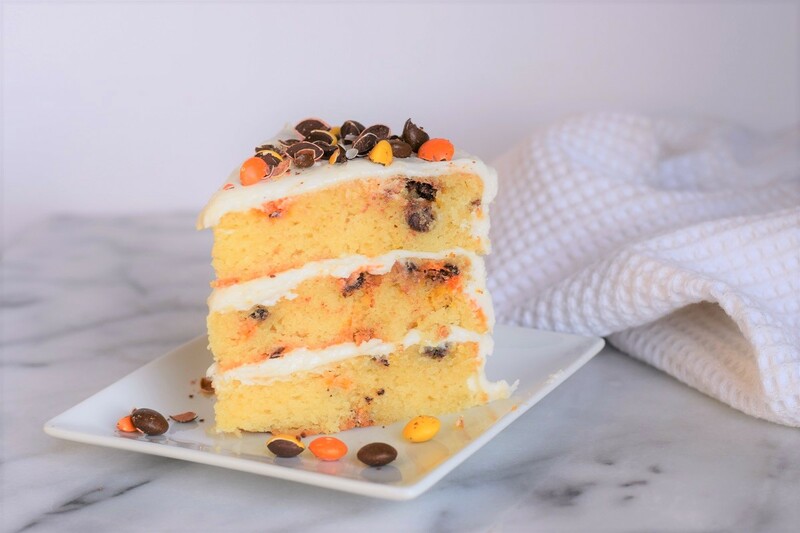 Sprinkle on some toppings and you have yourself two slices of 3-layer cake perfect for two! Maybe four, if you feel like sharing. 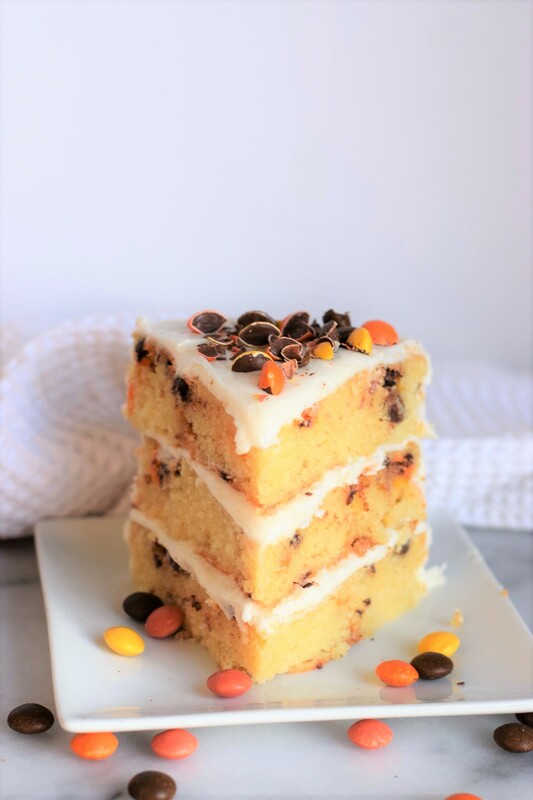 I considered making a funfetti cake in this style, but was out of sprinkles, and so I turned to the closest thing in my pantry – candy coated chocolates! 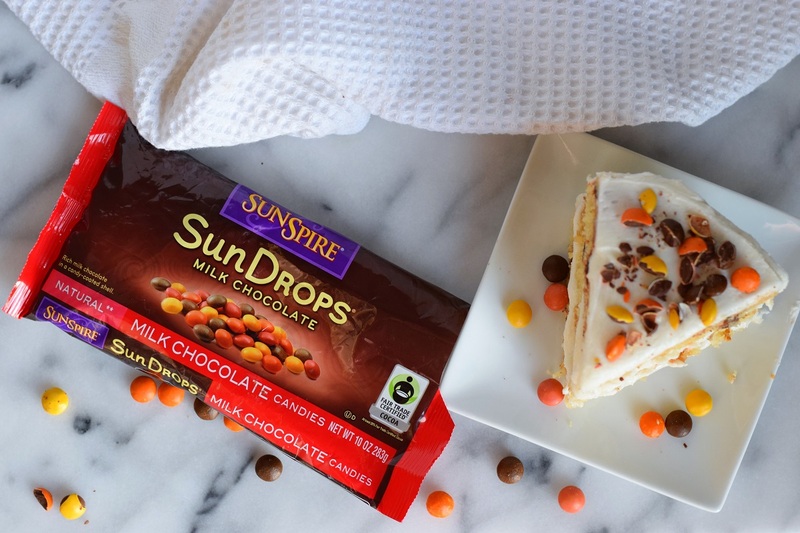 Most people know of M&M’s, but not many have heard of their more natural counterpart, Sundrops. These candies came in my last Degustabox (Use my code “WTQER” or the link below for 50% off!) and are milky and decadent, really reminding me of the chocolate you can get in Europe. The colors are more muted since they are naturally dyed, and I think they are perfect for the Fall season coming up! Get 50% off your first Degustabox, plus FREE shipping! I chopped up my Sundrops into smaller pieces to add in directly to the cake batter. Instead of mixing them in while the batter is in the bowl, I added them on top of the cake before it went into the oven. This way, most of the candies remained in the center of the cake as it rose in the oven. If you do not do this or you leave the candies whole, they will end up sinking to the bottom of every layer. For frosting, I stuck to my classic buttercream. Let’s not over-complicate things. 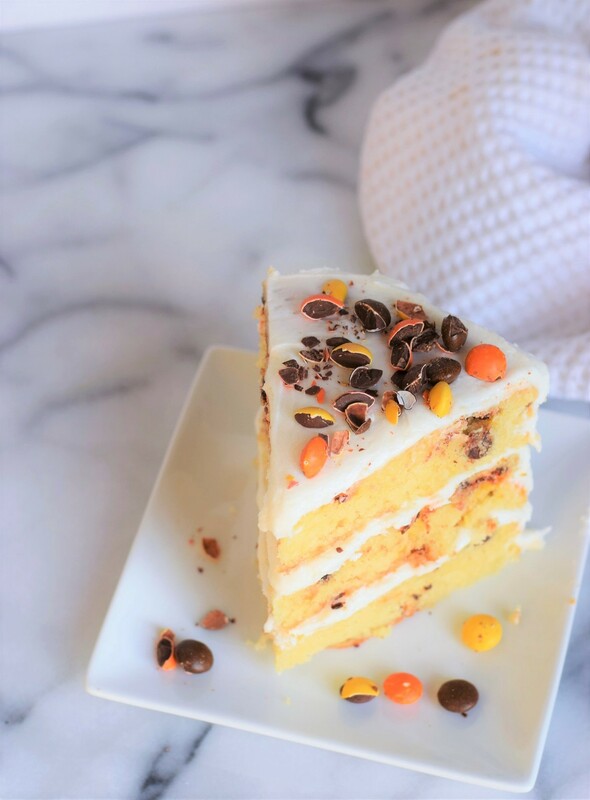 Try out this single serve cake slice method on your next cake craving night! Now that I’ve tried it, I think you can expect to see a whole lot more two cake slice recipes from me. 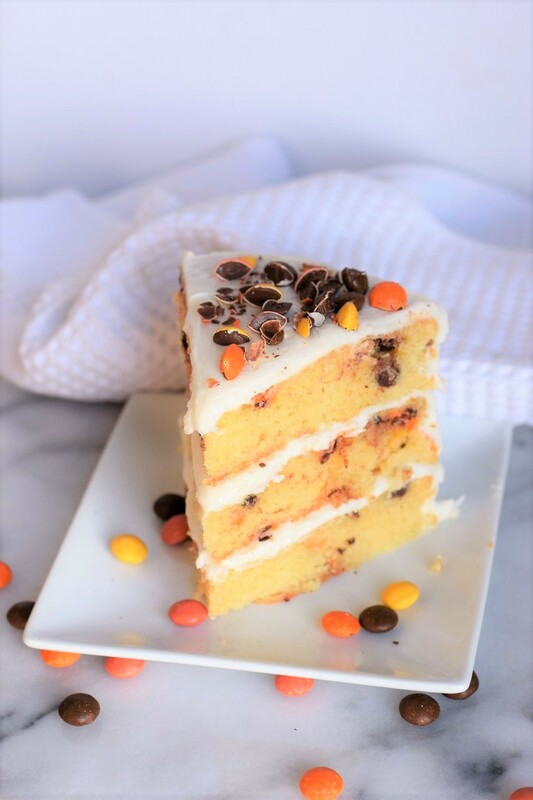 If you’re looking to make an entire cake (because you have friends you want to share with or a loving family that would be sad if you only made yourself a cake), just triple the recipe to make a full 3-layer cake. 1. Start by making your cake. Preheat the oven to 350 deg F. Spray a 9″ round baking pan with cooking spray and line with a sheet of waxed paper or parchment paper. 2. Cream together the butter and sugar for about 3-4 minutes, or until it is whipped and light in color. Add in the eggs one at a time and beat until combined. Scrape the bowl. 3. In two separate bowls, mix together the flour, baking powder, and salt in one bowl, and the buttermilk and vanilla in another bowl. Slowly add in the dry and wet ingredients alternating with one after the other. Mix only until fully combined. Do not over-mix. 4. 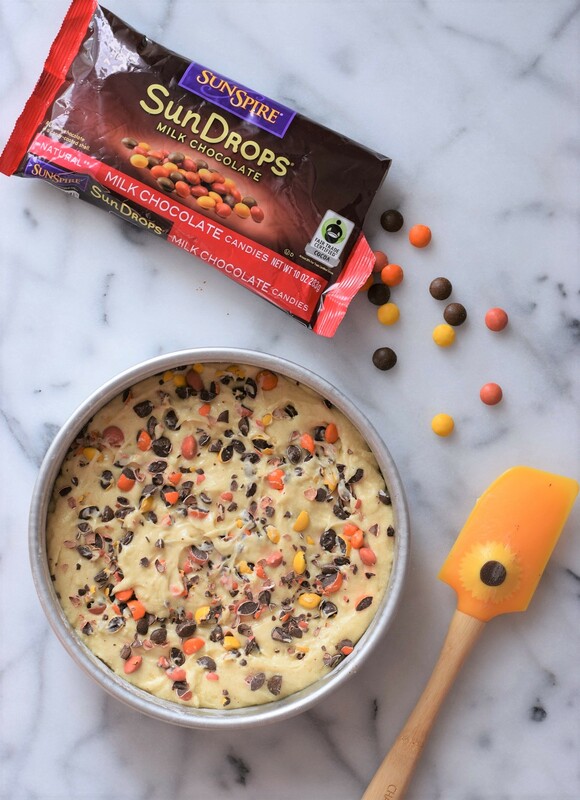 Pour your batter into the pan and sprinkle the chopped candies on top. Bake the cake for 36 minutes, or until a toothpick stuck into the center of the cake comes out clean. Cool on a wire rack for 20 minutes and then flip out and continue to cool. If the cake has a domed top, cut the top off to make it completely flat. 5. While the cake is cooling, whip up your buttercream frosting by creaming the butter and vanilla in a bowl. Then alternate adding sugar and small amounts of milk until you reach a whipped consistency that holds a stiff peak. Add in salt to taste. 6. 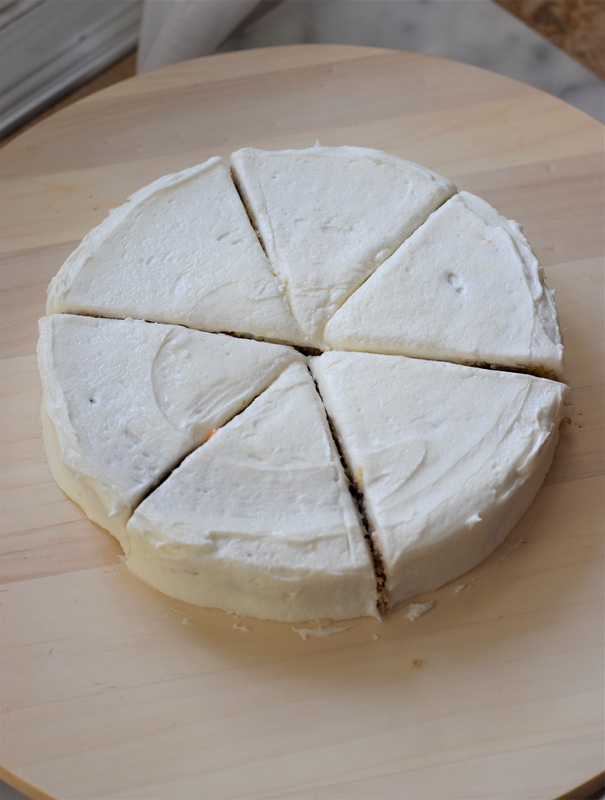 Assembly your cake slices by frosting the entire cake, top and sides, with the frosting. Then cut the cake into six even slices and stack on top of one another to make two 3 layer cake slices. Sprinkle the top of the cake slices with the remaining chopped candies. This is a genius idea because no one ever eats the last few slices in my house and we have to throw them away! Definitely doing this! I’m so glad you have this same problem! I hate throwing away cake! But like… who was the second person who ate this cake? I know it wasn’t Kyle. Still in the fridge!! Come eat it!